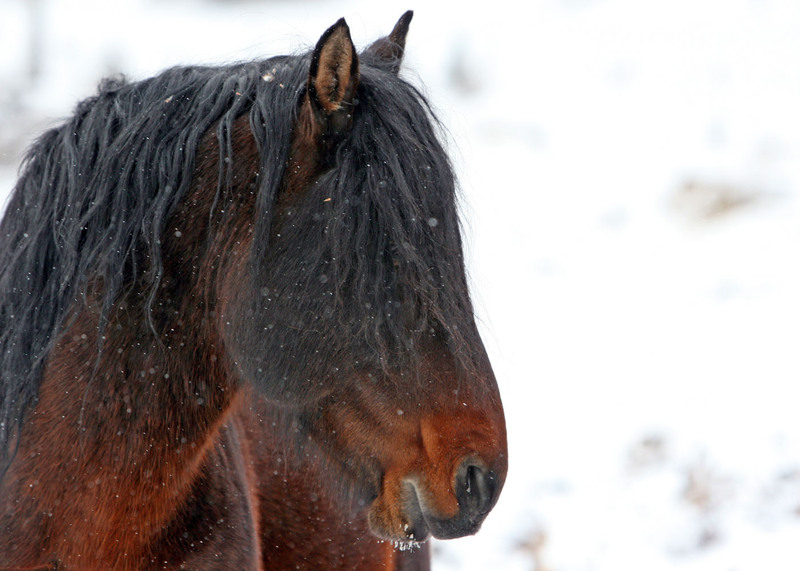 I wonder if the wild horses feel the same as I do, is this winter and snow ever going to end? In my travels the last few weekends it is amazing the difference in the tempature and snow depths that can be found from one valley to the other in the west country. At the eastern edge of the foothills the snow just keeps accumulating and gets deeper with each snowfall and most of the trails are inpassable due to the snow. 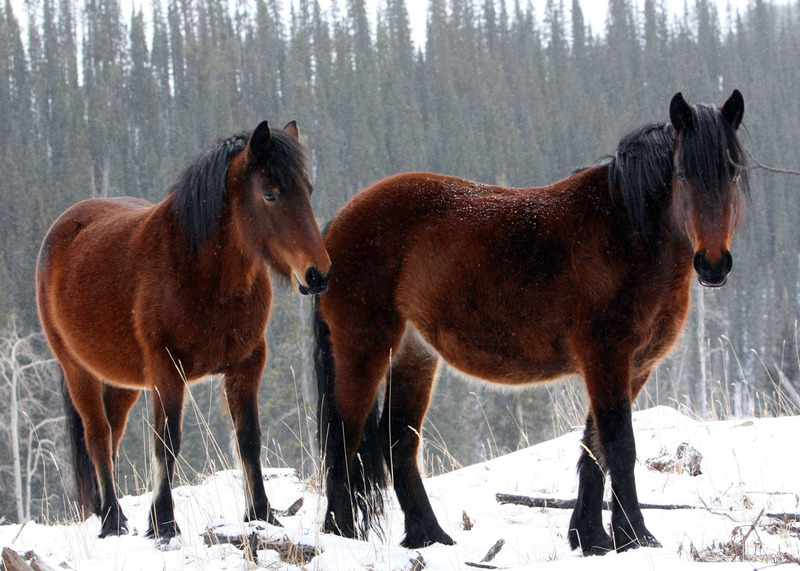 The wild horses have also changed their feeding and wintering patterns and are becoming harder to find. Then as I go further to the west, the warming sun and chinook winds have helped in clearing the hillsides and also in reducing the snowpack in the valleys. 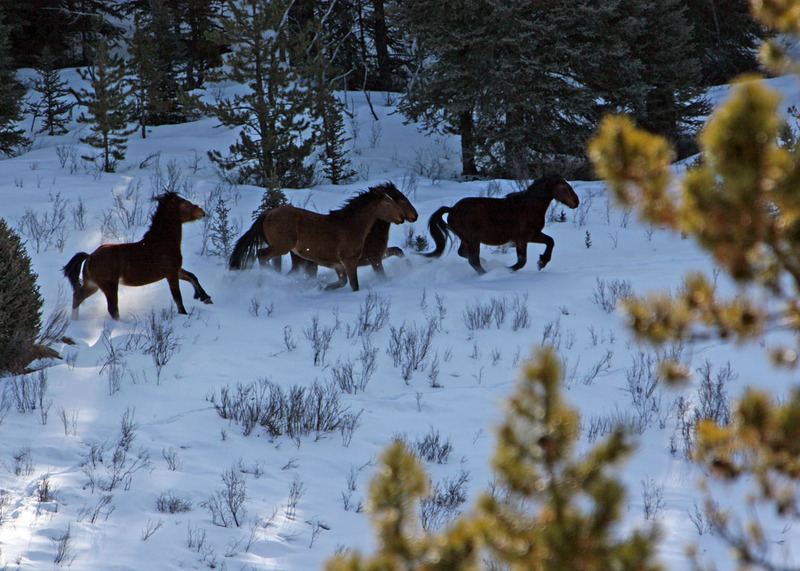 Here the wild horses are finding their foraging quite a bit easier. However, no matter where they are, the wild horses in the west country are wintering very well. 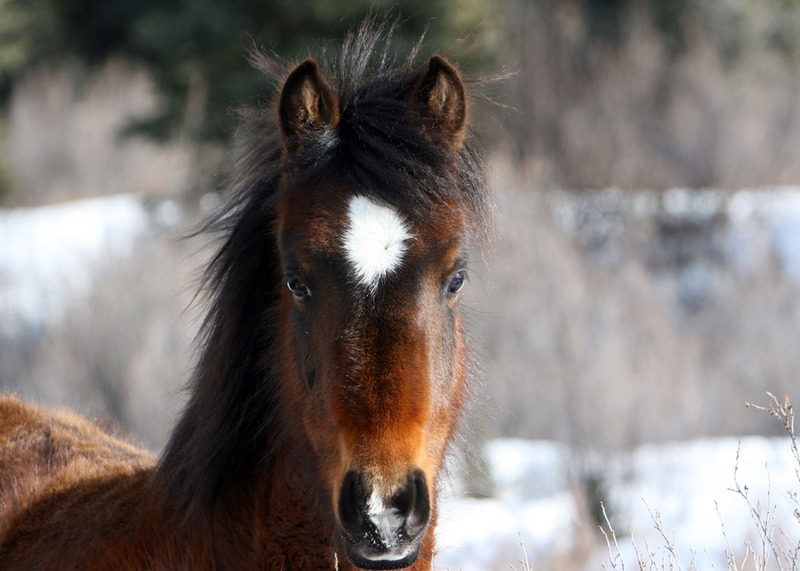 All the wild horses that we have come across are in excellent shape, even the young ones. A good number of the wild horse mares are very heavy in foal and in April/May we are going to see a lot of foals on the ground. 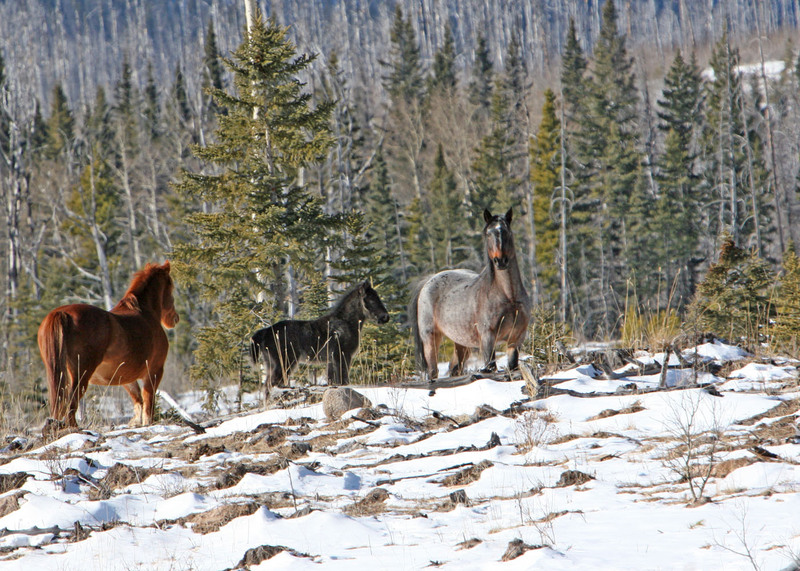 Hopefully the spring will be warm and sunny and the survival rates for the wild horse foals will be good this year. In my travels I have also been taking other people out to photograph the wild horses. These include professional photographers and one television network photographer. It was during a day with Rick Bremness that I was blessed to have one of those fascinating moments with the wild horses. 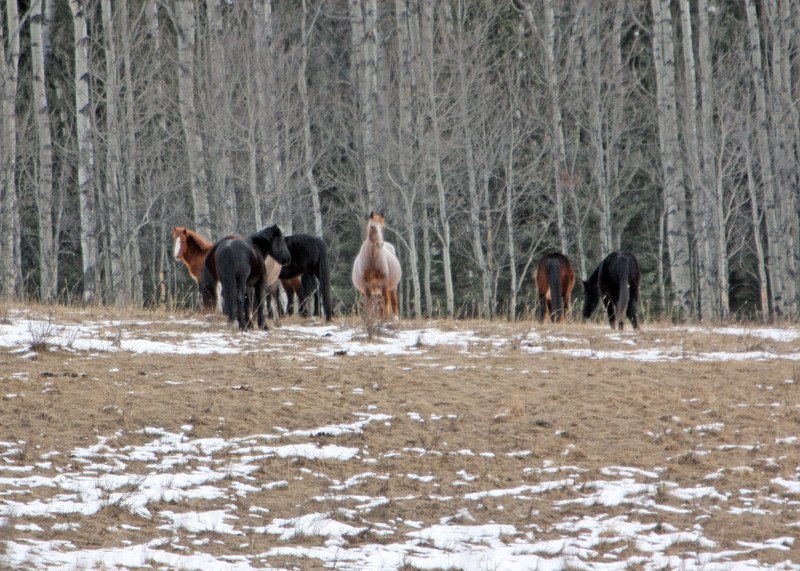 We had been out for two days filming the horses and late on Tuesday afternoon we came across a small herd, consisting of one stud, three mares and a 2010 foal. Rick was in the back of my truck filming and we would slowly go forward as he needed in order to get his pictures. Finally we were close enough, but the five horses were still hanging back in the edge of the trees. I offered to go around back of the horses through the trees so that I would push them into the opening a little more for Rick. 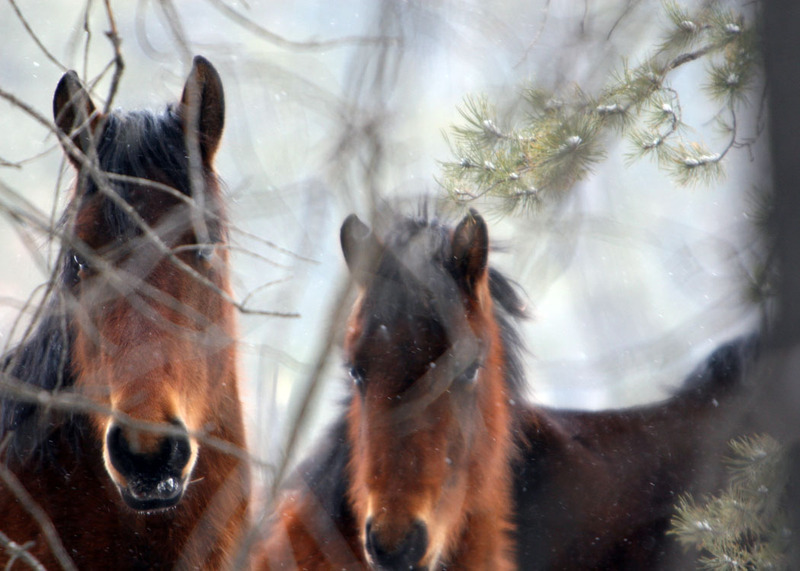 As I slowly made my way through the trees, of course taking photographs myself, I could tell the horses were more curious than afraid of me. As I got toward the edge of the trees where the horses had been standing, two of the young mares turned and came right up to me. 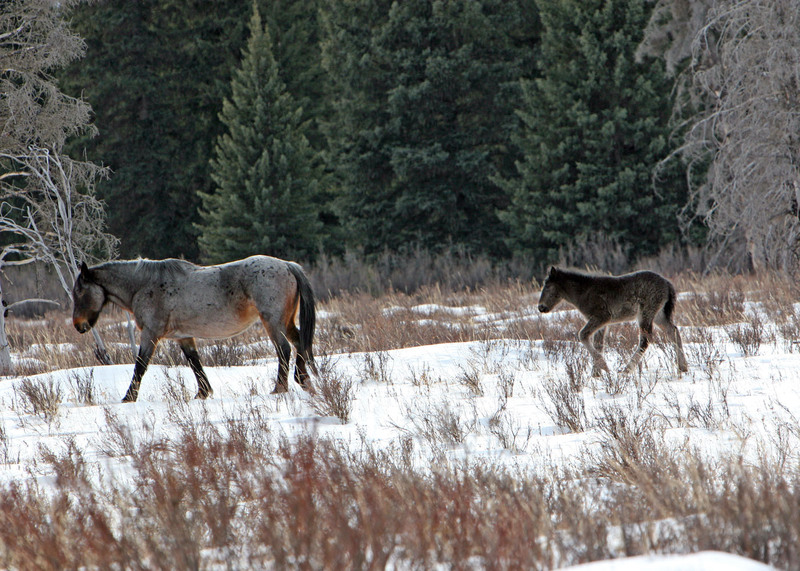 The young foal was right behind mom looking around her at this stranger in their territory. Less than five feet away, I talked to the horses in their language. 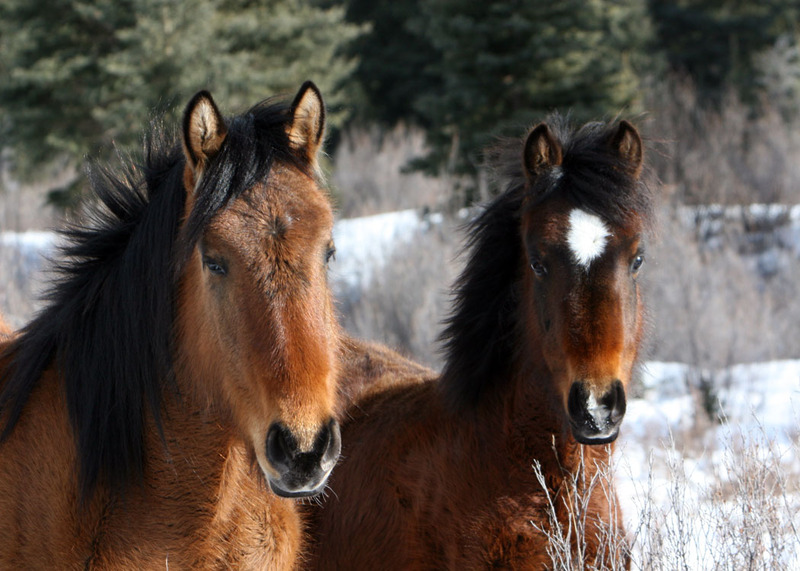 The wild horses, when not afraid, but curious make a purring sound, similar to that of a cat. As I mumered back at them, they just stood there inquisitively twitching their ears and looking at me with those beautiful soft brown eyes. After a couple of minutes they turned and walked back out of the trees and started to feed again. My heart just soared at the opportunity these magnificent wild horses had given me to share their space with them. When I got back in the truck, Rick continued filming as I jabbered excitedly away at the experience. Then again this Sunday, while out with another photographer, we came across the herd that contains two mares that in the past we had named Thelma and Louise. Both of these mares are very heavy in foal and also looking in very good condition. As the other photographer stayed back taking photographs, I again moved in with my camera. 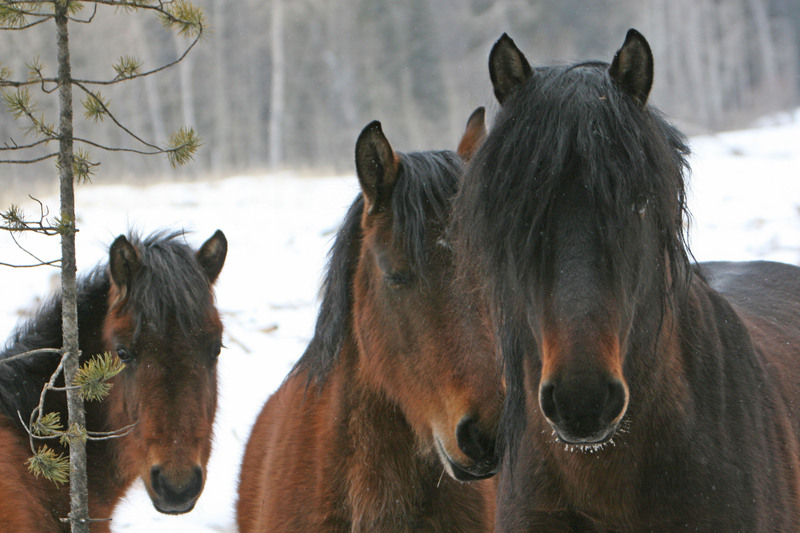 This time it was three of the younger horses that came within a few feet of me as I talked to them. Somedays, for me at least, life is just perfect. Everytime I can share these close encounters with the wild horses I feel truly privileged. This was one of those days. 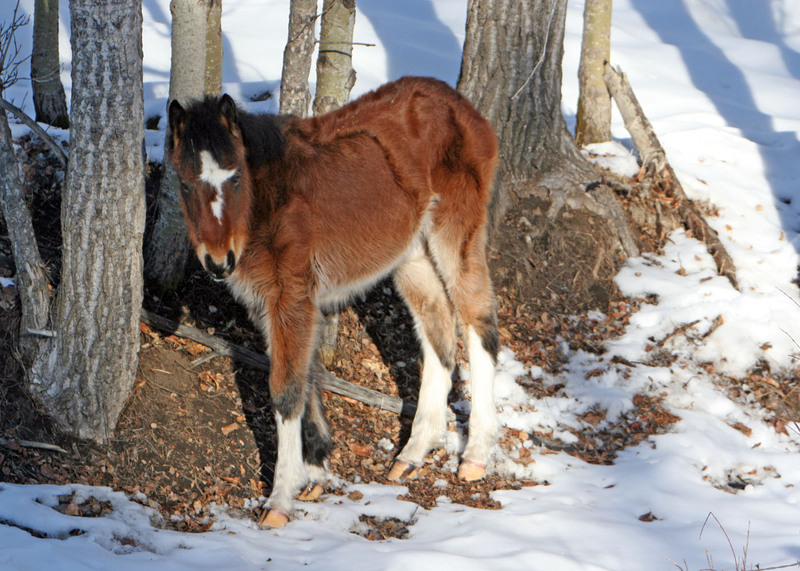 As far as the young foal, that belongs to the lead mare of the Wild Horse Creek herd, it is doing fantastic. The herd is very skittish and moves off quickly in order to protect the new addition and so great photo opportunities are not the easiest. It was fascinating though on Sunday as the herd started to move off, the youngster wanted a drink of milk and so the mare stopped to allow her foal to quench it’s thirst. The stallion, a beautiful black stud, immediately moved to the back and stood defiant and on guard protecting the mare and the foal. No wonder I love these wonderful creatures. I have one more short story from this past week. On our way home Sunday the 20th, we came across a wild horse foal that seemed to have been abandoned. Only about 5-6 months old it was trying to find food under the larger pine trees where the ground was free of snow. 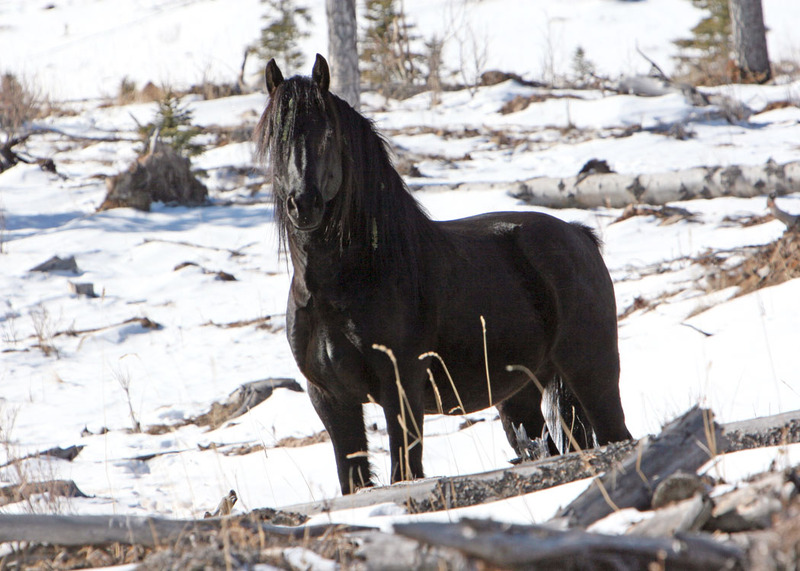 No herd was in sight and I feared that the foals mare had died or had been taken by wolves. The young thing would allow me to approach within 10 feet, but then would slowly move off keeping that distance between us. It was getting dark and so I decided to leave it, but I knew I should get some feed for it. I hurriedly got hold of Dan McIntyre, who lives north of Sundre. He offered me a bale of hay to take back to the foal. Off we raced up to Dan’s, picked up the hay bale and then back to the young foal. I slowly approached again and spread out some hay for it to feed on. It would have been worse to scare it off in the dark and so we left it alone for the night. Talking with Dan on the phone that night, plans were made to take horses back out on the Monday, along with some panels and try to rescue it. We feared without help it would perish. Family day morning found Dan out with some help trying to locate the foal. I had not been able to locate it myself as I headed west with my crew. As Dan rode into the area he found a herd of wild horses moving toward where the foal had been and it appeared that they had returned to find the young one. Dan at that point decided to leave it like that. Then this Sunday I came across the herd close to the road and indeed the young one was with the herd. l still do not know about it’s mother, but will keep an eye out for how things do turn out for it. 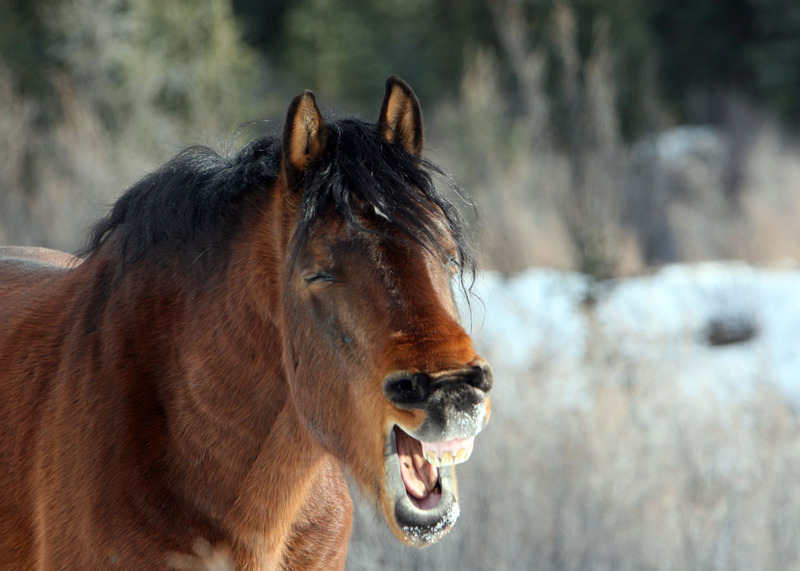 Thanks again to all who still write and e-mail with their support for the work WHOAS does in protecting your wild horses.